We stayed in Rome until 27 April, when we left for Florence. We had intended going round by the attractive town of Perugia, but the morning of the 26 was wet, and, delaying our departure for a day, we gave up Perugia, partly because to have gone upon a Friday would have involved spending a Sunday there. The latter part of our journey was interesting. On arriving at the outskirts of the town the railway circumnavigates it, so that we had an opportunity from the very first of seeing the cathedral dome and campanile, and the other towers and spires of Florence, which lies beautifully situated in a luxuriantly verdant valley, enclosed by the Apennines and other hills, and intersected by the river Arno, which, seeing for the first time in the soft moonlight in the course of the evening, looked so lovely. The Lung’ Arno, or bank of the river, where most of the principal hotels are placed, is considered the best situation, at least for winter residence. Some of the hotels are unpleasantly near a waterfall or wear stretching across the river, the incessant din of which is troublesome at night. 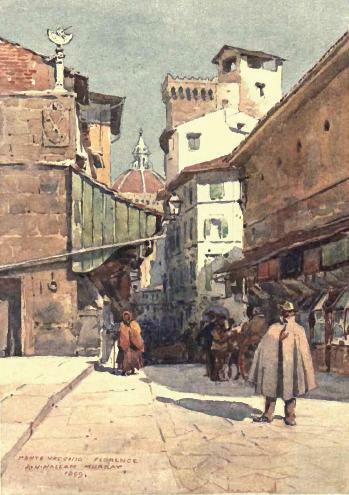 We spent a few nights at one of the hotels there, and afterwards a fortnight at the Pension Molini Barbensi on the left bank of the river, where we found pleasant society and some former travelling acquaintances. The house is a good one, and the rooms are large, but a very little expenditure on sanitary arrangements would improve it as a residence. Living seems not to be expensive at Florence, and lodgings can be procured at a moderate rate. 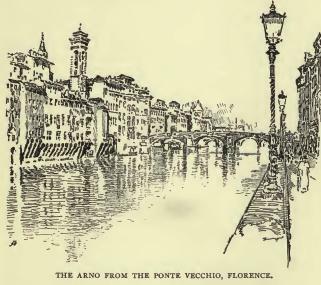 Florence lies upon the same river as Pisa, but I suppose fifty or sixty miles farther up, and the town bears some resemblance to it, but is far more picturesque and far more lively and populous. In fact, Pisa is quite a dull, quiet, dead-alive town beside it. The population of Florence, at present about 170,000, is four times as great as that of Pisa, and it has been a royal town as well as a provincial capital. The river is crossed by six bridges (three, or rather four of them, of very old date) connecting the north and south portions of the city, which, however, lies mainly upon the north shore. 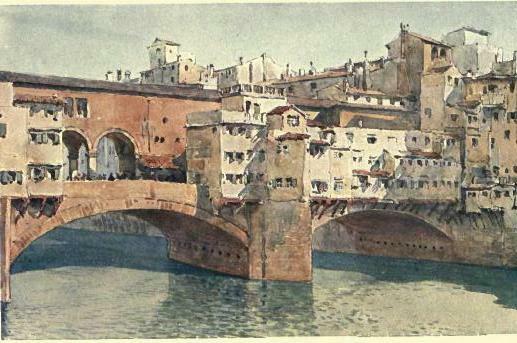 Of these bridges (all strongly buttressed against the force of the river, which no doubt occasionally descends in floods with great power), the Ponte Vecchio is peculiar and picturesque, and a remnant of old times, being covered on each side with houses, and on one side, on the top floor, by the long gallery which connects the Uffizi and Pitti Palaces. These houses on the bridge are very curious. Next the street they present to view on both sides small booths or stalls, principally occupied by goldsmiths or jewellers, which very likely much resemble what the shops of Old London were, but at the present day do not, for jewellers’ wares, inspire confidence.